Ever wondered if you could better results with less work? Maybe you’ve been building your online business for a while now. Showing up each day, working steadily. You’ve had some success, but you can’t shake the sneaking feeling that you should have been farther along by now. Not farther along just for the sake of speed, of course, but father along, maybe, in terms of ease and dollars. Tired of working so hard with too little to show for it? You blog when you can. Interact in Facebook. Post Twitter updates as you think of them. In short, you have all the pieces people say you should have, but, somehow, they don’t seem to be working for you. You still find yourself having to do all the marketing yourself: teleseminars, speaking, networking, and blogging. It works, but just until you get busy- then you gradually slack off on marketing (don’t feel badly, this happens for all of us), and then you find that your business goes through a downswing. You then have to work really hard again to build your client base, and that lasts until – yes, you guessed it- you get busy again. What if I could share with you a 12 stage plan for building your online presence and converting that into clients? A way to get value from your social networks AND make money in your business in a consistent and sustainable way? In short, what if you could be both profitable AND popular? And if it could be easier and faster than everything you’re doing right now? 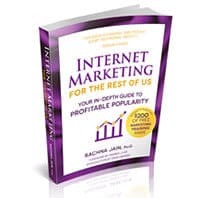 Get the book people are describing as the Internet Marketing Bible for the rest of us! Yes! Please Send My Copy! Hi- I’m Dr. Rachna Jain, and I’ve been working online for more than fourteen years. In that time, I’ve built three distinct sixfigure+ businesses almost purely from the Internet. What this means is that I used the Internet to create client leads, and I converted those client leads into dollars in my business. At this point, my longest running business generates about 30 client inquiries per month, and I’ve referred out those leads to other coaches, helping them build their businesses rapidly. I’m purely self taught in online marketing, as my educational background is in psychology; and I’ve been able to develop a powerful method for helping my clients build more profitability, with less effort. All of my clients are benefiting from learning how to use the Internet to help them achieve their business goals. I literally have Rachna on speed-dial. Before Rachna helped us, in an average month, we’d sell one or two products we weren’t promoting and I’d get one unsolicited request for coaching. But after Rachna? Well, just yesterday I sold 2 courses in our store, talked to 3 people about coaching, and helped my team with about a dozen other requests for products and services. As you read the chapters of this book, you’ll cut through the hoopla and discover the exact formula for turning a popularity contest into something connected and measurable. Personally, in reviewing the book, I was led to logical conclusions that enabled me to simplify business strategy, whittle down wasteful processes, and make clearer, quicker decisions about things that haven’t been working. It’s already saved and earned my businesses a noteworthy amount of time, money and energy, and I know it will continue to do so because I intend to come back to the book again and again. If you’ve felt left out and passed by as far as marketing on the Internet, I think my new book “Internet Marketing for the Rest of Us: Your Guide to Profitable Popularity” will be worth reading. In this 264 page book, I share with you key business frameworks and a three part strategy for becoming more well known and making more money online. I share with you case studies of heart centered businesses, just like yours, who are using the Internet to attract more clients and make more sales. Your online business needs this book. Please take the next step and order your copy today.